304 pages | 42 B/W Illus. 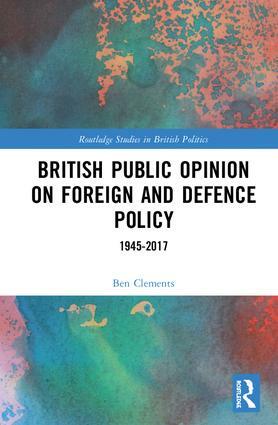 This book provides a long-term perspective on the opinions of the British public on foreign and defence policy in the post-war era. Thematically wide-ranging, it looks at the broader role of foreign and defence policy in British politics and elections, public opinion towards Britain’s key international relationships and alliances (the United States, NATO, the EU and the Commonwealth), and public opinion towards the projection of ‘soft power’ (overseas aid) and ‘hard power’ (defence spending, nuclear weapons and military intervention). Assessing the main areas of change and continuity in the public’s views, it also pays close attention to the dividing lines in wider society over foreign and defence policy. Analysing an extensive range of surveys and opinion polls, the book situates the analysis in the wider context of Britain’s changing foreign policy role and priorities in the post-war era, as well as linking public opinion with the politics of British external policy – the post-war consensus on Britain’s overseas role, historical and contemporary areas of inter-party debate, and enduring intra-party divides. This text will be of key interest to scholars and students of British politics, European politics, foreign policy analysis, public opinion, defence and security studies and more broadly to comparative politics and international relations. Ben Clements is Associate Professor in the School of History, Politics and International Relations, at the University of Leicester, UK. This series aims to engage experts in the fields of UK politics, political history and public policy-making whilst addressing a wide array of political dynamics, contexts, histories and ideas. Many of the current major political trends and issues - such as the long-term impact of Brexit, the implications of political disenchantment, the surge in party membership, growing constitutional strains on the UK, and the unbalanced nature of formal political participation in terms of class, gender and ethnicity - are major challenges to political elites. Promote research excellence with regards to British politics, including interdisciplinary collaboration. Engage and inform the public debate about the nature of British politics. Contribute towards the development of public policy. Stimulate innovation in teaching and research. British party politics: how different parties in British politics are responding to new electoral, organizational and policy challenges. Remodelling the UK polity: (De)Europeanization, devolution, and multi-level governance are promoting new national projects while delegating and dispersing powers from the centre through a ‘new localism’. Managing the public household: including regulation,　industrial policy, the economics of austerity, and politics beyond the crisis. Society and State: citizen-focused public policy, digital politics, the relationship between parliament and citizens, the politics of gender, civic participation, populism, immigration and culture, declining public trust, and the politics of public expectations.